Reports back in January indicated that Apple and LG Display were in talks for the South Korean company to supply OLED panels, for use in the so-called "iPhone X Plus" that will arrive as part of this year's iPhone line. The idea was to diversify Apple's screen supply and reduce its dependence on rival Samsung Electronics. But according to a Wall Street Journal story published Friday, LG is "struggling" with quality panel production, putting Apple's plans in peril. Citing "people familiar with the matter," the Wall Street Journal is reporting manufacturing problems, indicating that LG may not be ready for the start of mass production of the iPhone in July. Opinions are reportedly divided within Apple as to whether LG Display will be able to make the phones in time for this year's line. The issue, the Journal wrote, is that LG Display specializes in TV-sized OLED panels, of which it is the world's leading supplier, although the company "has yet to nail down" the production of smartphone-sized screens. Reports in 2017 indicated that LG would not be ready to make iPhones until 2019, although in December LG was reported to have a deal to enter the supply chain. Apple finds itself in a disadvantageous bargaining position in dealing with only one supplier for the OLED screens, which are one of the more expensive parts of the higher-end iPhones. Complicating matters is that Samsung, the supplier, is also Apple's main hardware competitor in smartphones. Meanwhile, LG Display, also based in South Korea, is itself a major rival to Samsung. Apple is expected to make about 100 million iPhones this year, according to analyst consensus, with about half of those using OLED screens. 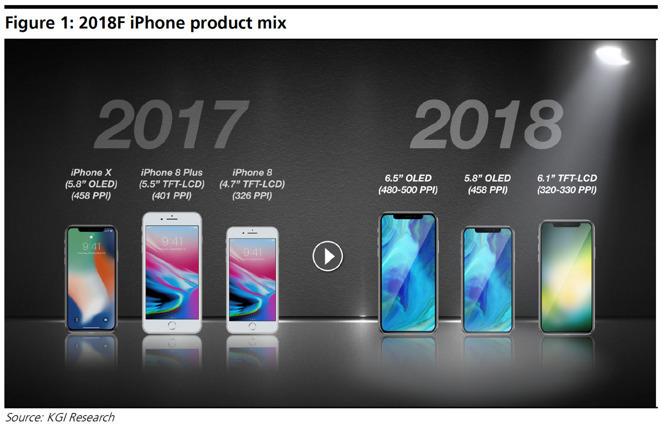 When Apple began producing what became the iPhone X throughout 2017, it soon became clear that Samsung was the only company able to mass-produce OLED panels of the size necessary for the device. Producing OLED screens is much more difficult, as a single speck of dust is capable of ruining an entire screen during the process of initial fabrication. Samsung has long used OLED screens on its own Galaxy devices. In addition, OLED production for TV-sized panels is a mature process that's been around for years; using the technology on a smaller scale, and with optimization for a touchscreen, is much more complicated and difficult. Apple and Samsung first reached an OLED panel deal in 2016. But by late 2017, before the iPhone X was even introduced, analyst Ming-Chi Kuo of KGI Securities was writing that Apple was in "urgent need" of a second source of OLED panels. Apple's deal with LG, announced in December of 2017, was meant to alleviate that need, and likely give the iPhone manufacturer more leverage for cost negotiations, but whether it actually will in a timely fashion is in question.